The strategy pattern embodies two core principles of object-oriented programming, it encapsulates the concept that varies and lets programmers code to an interface, not an implementation. 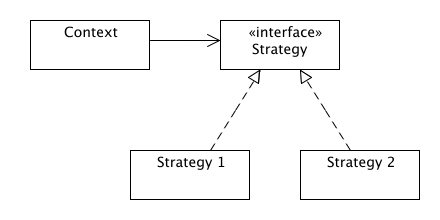 The strategy pattern shows you how to implement different behaviors (algorithms) in a seperate class hierarchy with an interface at its root. The goal is to decouple the objects which use your encapsulated "strategies" (the context) and the strategies (algorithms) themselves so that they can vary independently. The strategy pattern is also known under the name "Policy". many related classes (tightly coupled classes) differ in their behavior. Strategy lets you "configure" a class with one of many behaviors. you need different variants of an algorithm. For example, java swing uses the strategy pattern to implement different styles of borders on JComponents. Since these strategy variants can also be implemented in a class hierarchy they become interchangeable. you want to decouple complex, algorithm specific data structures from the clients which use them. With the strategy pattern you can encapsulate complex data structures and avoid exposing them to the rest of your program. Instead of implementing the paintBorder() method with one huge switch statement and directly calling the methods which do the drawing, the Swing developers have decided to use the Strategy pattern in combination with Delegation. 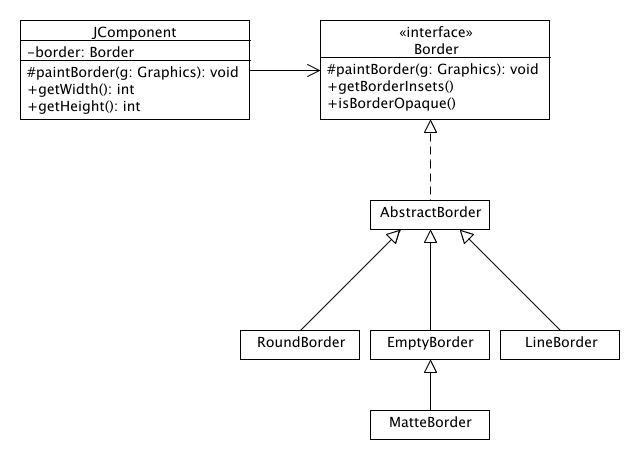 Here, the method which paints a components border is provided by the border object. The Delegation pattern becomes obvious by the "this" reference passed to the paintBorder method of the Border object. It is used by the Border object to retrieve information about its Component. if (border == null || oldBorder == null || !(border.getBorderInsets(this). Implement a Strategy interface for your strategy objects. Implement ConcreteStrategy classes that implement the Strategy interface, as appropriate. In your Context class, maintain a private reference to a Strategy object. In your Context class, implement public setter and getter methods for the Strategy object.